The Allison Analogy of the Week. Is There Anything in Your Tub? In coaching REALTORS, conversations often take a turn to the feeling that nothing is happening and that momentum isn't building. As I coach, visual images always come across my mind and this week the bathtub has found it's way in to a few sessions. 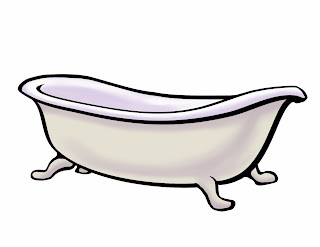 Momentum in Real Estate -especially for a newer agent, is like this bathtub. Take a look at this photo: Is there any water in the tub? Most often, the answer I get is, "No, Nothing in the tub." My response is, "How do you know?" Then the light bulb goes on. There could be water in the tub, yet we can't see until the tub is full or overflowing. "The work you are doing, even now is earning you money and building your business." Starting a real estate career can bring with it a need for ridiculous faith especially when one is used to a "this-for-that" world where exchange of services or goods for money, or exchange of actions for results is immediate. Ridiculous faith is only necessary because we may not be used to the 90 day, and COMPOUNDING effects of our efforts. Sadly, many give up before the tub is full not even realizing that they were just days away. They pull the plug on the tub. Prospecting fills the tub. Each day the measure of fill is added to the previous day's fill. Repeated activity over time gets results. If you stop filling the tub, just because it feels or looks empty, then you are in effect, pulling the plug on past efforts. Tub empties. 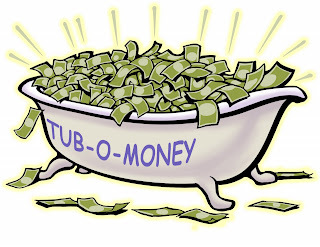 *Note...your tub may be full of clients....or time..
Money isn't the prize....it is what the money provides. Having enough of it is often the cure for worrying about it and so money is what we chose to put in our tub. Besides, it is fun to envision a tub full of money. Thanks to Jimmy Longacre for illustrating this concept for me professionally. Jimmy your creativity applied to my analogy is greatly appreciated and I know your creativity for your real estate clients will be too. Are you overwhelmed with unfinished tasks? Have you forgotten to return important calls? Are you finding yourself overwhelmed with the busy-ness of real estate? Are you simply finding excuses to avoid your crucially important prospecting time? Are you finding that your most important tasks are getting the last and weakest bits of your attention.? My answers have recently become: YES- YES-YES and a bunch more YES. I hear and see the same from agents I work with. How can we get back on track? Here is one simple, tactic that you can implement right away to get the control back. Set an appointment with yourself for each task that needs to be accomplished. There is a saying around KW-- I think said often by Gary Keller, "If it isn't in my appointment book, then it doesn't exist." Regularly, I ask agents in my classes to pull out their appointment books and almost always, the only things in their books are the times of specific classes, the time they will be doing an open house, or possibly showing appointments. The rest is EMPTY white space. The empty white space that when we see, we subconsciously think "free time." Not getting in your calls to past clients? Create an appointment for that and show up. Avoiding picking up the phone to call your sphere and ask for referrals? Set an appointment for it. Not practicing scripts? Set the appointment. Not tracking your numbers? Set the appointment. Not previewing properties or studying the market? Yep, set an appointment. Finding that you are arriving unprepared to your coaching sessions? Yep, set an appointment for that too. Seller care and follow up? Appointment. Let your sellers know they can expect a weekly update from you between xwz and abc time each Monday, and of course will contact them immediately when there is an offer..
time sucking wasting look up and your whole day is gone e-mail. Appointment. Yes I know it is hard. Even catch up time, or interruption handling time..breaks....Facebook time? APPOINTMENT. When you start scheduling appointments for even the smallest things, it becomes easier to get all the tasks done. Control your interruptions, set communication expectations with your clients. Here is how to start: Get out your list of tasks, monthly, weekly, biweekly, daily and write them down. (Remember-prospecting is DAILY). Now, think back to kindergarten...yep, when we learned the basics of a good full and productive day...when every minute of the day was scheduled--even the transition times. Start creating a draft of your new appointment book. The most important and money making tasks should be done in the morning so that they are less likely to be missed. 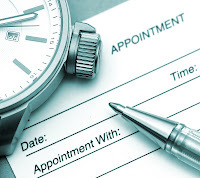 If you have to move or erase an appointment, find a spot to reschedule it. If it is important...put it on your calendar. If it isn't....why are you doing it?